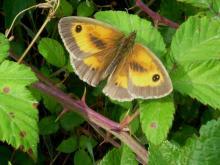 This summer has been kind to butterflies, or it was until the recent rains and squally weather. In spite of this deterioration there are still good numbers flying. 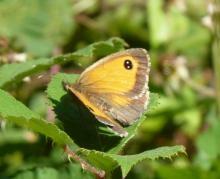 The last of the summer butterflies to emerge, the Gatekeeper, is now out in good numbers. It is a small brown and orange insect which frequents flowers like bramble, scabious, knapweed and fleabane; it got its name from its habit of basking in hedgerows where it would get disturbed by farmers passing through the gates. It can be seen all over the gardens, especially on Daffodil Meadow where I counted over 50 on 1st August. Male gatekeeper (left) with black bars in the forewings and female (right) with plain forewing. 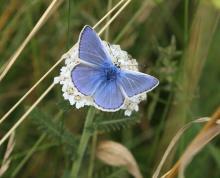 There are also more Common Blue butterflies (left) around than we have seen for some time. This brilliantly coloured small blue butterfly uses bird's foot trefoil, which grows in patches on the Meadow, as the food plant for its caterpillars. The female is almost brown, and is less easy to see. 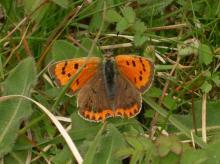 The butterfly is often seen on the mown path or flitting over the long grasses. In the photograph it is nectaring on yarrow. Another very small and exquisite looking butterfly with shining coppery wings dotted with black marks is the Small Copper (right). I've seen several over the past few weeks and it, too, seems to be having a good year. 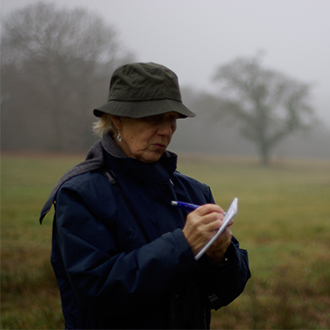 I usually find it basking on a bare piece of ground, or on short turf, though it also occurs in woodland rides. Its food plant is common or sheep's sorrel, or sometimes dock.